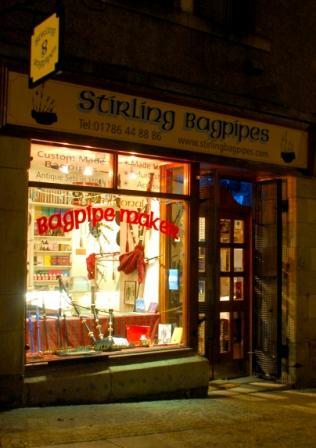 It’s rare that we would feature a shop on these pages, but Stirling Bagpipes in Broad Street is rather more than that. The humble shop front belies this family run businesses international reputation for the repair, refurbishment, design and manufacture that most iconically Scottish of musical instruments...the bagpipes. Highland Bagpipes, Scottish Smallpipes and Border Pipes are hand-crafted here, and visitors can see these elegant instruments being made in the workshop, or view a wide range of antique bagpipes of classic makes - Henderson, Glens, Lawries, Robertson and Starck to name but a few. The traditions and history of these distinctive instruments are fascinating in themselves, and the pipe-maker’s passion for his craft is plain for all to see.